SORRY! I didn’t want to start my first post of 2012 with an apology but I had to give a big one for the site not being updated in over a week. Ugh. Now that the holidays are over, though, and a lot of the stuff that’s been keeping me busy for the past few weeks has been settled, I’m hoping to get back on track with regular updates every Tuesday and Friday starting next week. I have a lot planned for you readers in 2012, so if everything goes smoothly, this should be JEFbot’s biggest year yet! Again, sorry for the irregular schedule, and Happy New Year! 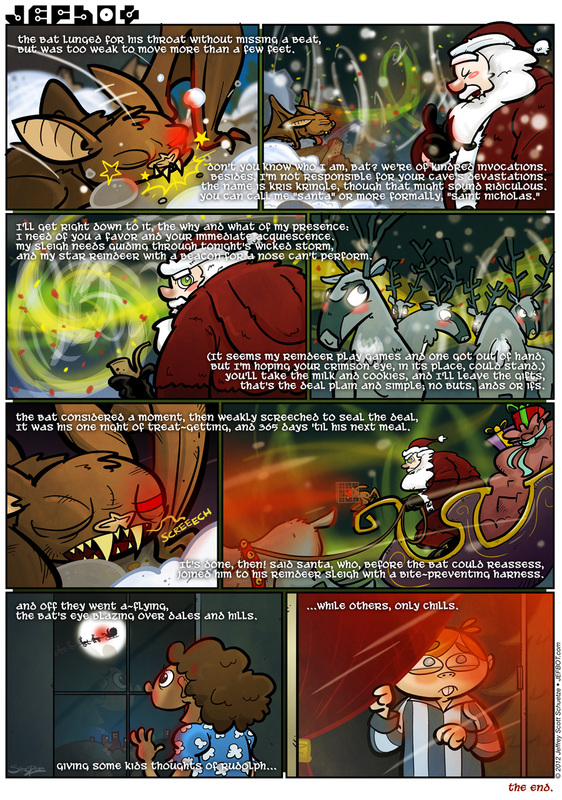 This is the last of 2011’s Christmas Bat arc! This one ends on a bit of a cliffhanger as The Bat’s rather homeless at the moment and we didn’t find out who was responsible. No doubt that question will be answered in a future installment. And now that this tale has ended, expect some regular standalone strips before we launch into the next big storyline! I pity the poor kid on the last panel, not a nice sight for christmas I guess. Damn, now we have to wait another year for the conclusion of this tale! happy new year, F_F! and yeah, i pity the kid, too. if he looks familiar, it’s because he’s had somewhat of a run in with TCB previously. That kid just can’t catch a break. Woohoo! First shades of the year! I commented so late/early this morning I didn’t even realize I was first. I shall carry them proudly! Woohoo! Wholeheartedly support either option! This legend keeps getting better and better! And the art is gorgeous. Next year: Chistmas Bat v. AngryScarf? thanks for the kind words about The Christmas Bat’s latest “legend,” Sarah W! and he’ll definitely be back either this October or December. hmm… i think a battle between him and the Angry Scarf would be pretty epic! heheh. yep, he’s like coal in your stocking, Jiro Maeda, only with sharp teeth and a bad temper! I liked the ending to this year’s Christmas Bat story. I’m excited to see what the next storyline will be! My fireman friend told me a story about having to retrieve a bat that flew down a chimney from someone’s house. Now I know why! i just hope your fireman friend knows not to wake a sleeping bat on christmas eve, Stan, lest it be the Christmas Bat he disturbs! Dang! I don’t think I’ll ever get the Shades of Firsting. 🙁 Still enjoy reading, though! I love the ending! This was the best TCB so far. Good Morning Botilians! (that includes everyone!) Happy New Year to you all. Hope you all had a safe and holiday season. So…incase you haven’t seen Jeff’s, Michael’s (the real life inspiration for our very own Cornfather) My, or the Jeffbot Fan Facebook page…Shame on you. Kidding! If you haven;t seen those pages than you missed the announcement that Grey Skies is on Chiller tonight, 1/6/12, at 10 pm EST. I for one am excited to pieces! I can’t wait to see our boys in action. In the commercial you can see Michael a bit and I think you can catch Jeff in a window scare. I will be watching and online at the same time if anyone else would like to chit chat as we watch. thanks, Pixie! i’m glad you thought this was the best “Bat” yet, since it took me the longest to write and draw! i might just have to break the story up into smaller chunks next year so the schedule doesn’t suffer as much. I LOVED Grey Skies! Hearing you and MC’s voices was such a treat. Now whenever I read anything you guys post on here or facebook, I hear your voices in my head. Hubby actually got all into it too. I want the DVD now so I can see it all unedited cause Chiller edited the heck out of it. But you and MC had the best lines. I was so proud! I chatted you guys up all over FB. aWWWWW!!! THANKS, Pixie! glad our voices are in your head now – tho preemptive apologies if we get annoying in there. wha??? Chiller edited the movie!? how dare they! grrrr… but now i’m kinda interested to see which version they used. i must’ve seen at least 3 versions when they were editing the movie! btw, remember how you recommended Trick R Treat, like, a year or two ago? i forgot to tell you that i finally saw it around Halloween. SOOOOOO good! i can’t believe they didn’t give that movie more promotion and a wider release. i think it’s going to be a Halloween tradition around the BOTcave from now on. thanks for the recommendation! Woo, new Christmas Bat strip! Don’t feel too bad, Jeffbot, the Nostalgia Critic had to postpone a Christmas review because his computer died on him. Ooh, Pixie…I was totally planning on cancelling my cable this weekend. Now it looks like I’ll have to watch Grey Skies because otherwise I’ll have to DVR it and hold onto cable until I watch it. thanks for the support, Joe! i hate to miss updates but this holiday was a doozy. i should be able to get back on track now that 2011’s behind us. hope you had a chance to catch the movie! Only Santa could talk the Christmas Bat into standing in for Rudolph instead of causing fear and destruction. (Well, I guess some kids are still a bit scared.) How awesome! Happy New Year! By the way, I did get Grey Skies for Christmas. I enjoyed it, but it will be a while before I let Taran watch it. Without giving away any spoilers, I liked that its ending didn’t follow the traditional horror movie formula. I just read your comment on the previous strip on my new Avatar. The cowl is from a raw fleece my vet gave me (she keeps sheep) that I carded, spun, and knit. It was a lot of fun to go from fleece to finished project, but I have A LOT of fleece left. ohhhhh you spin your own wool?! OMG I am so amazed and awed by you Miss Shanna. I would love to try it. I’ve even looked up prices for wooden drop spindles. Pixie, I don’t know much about drop spindles. I tried to learn to spin on one and was not terribly successful. Then I took a wheel spinning class and loved it. I bought myself a used wheel about a year and half ago and haven’t used a drop spindle since! thanks, Shanna! glad you found Santa’s role in The Christmas Bat’s storyline sufficiently awesome. we’ll see if The Bat ever does Santa a favor again in the future. and i’m happy you had a chance to watch Grey Skies and enjoyed it! but yeah, i think it’s a good idea for Taranchilla to wait a few years to watch it; there’s some spooky stuff there. and as far as the ending goes – *spoiler warning* – i liked it, too, as it leaves it open for us all to get back together for a sequel! Happy new year man, and I hope your eye is feeling better. …at least for now, Fijiman. the Bat still needs his revenge!!! I LOVE the bottom panels! Those kids are BATiful! thanks for the BATastic comment, Funnyshaffer! Happy New Year, Jeff! And welcome back! woo! thanks for the flipping awesome comment, Javis! This is so cool! And I love that you made everything rime, somehow it makes it even better! I <3 JefBOT! the rhyming has become somewhat of a Christmas Bat tradition now, DAS. i won’t say that the Bat’s comic strips will always be that way, but for now i feel the same way you do: that rhyming makes it better! All it wanted was to be a bat. and it wanted christmas treats, John! but someone thwarted him this year. hmm… who could it be? HAPPY NEW YEAR, JEFBOT! Welcome back (as it were). Hope your year is off to a good start. Take care and say ‘hi’ to everyone for me. thanks, KB – i’ll pass your new year’s wishes over to the rest of the BOTfamilia! Okay, I finally saw Grey Skies. And I have two things to say about it. 1) It was an awesome movie that deserved to have been in theaters it was so good. 2) My mother now has questions about your sexuality and relationship with Michael Cornacchia. yay! arigato for the snaps, Ebony! happy you dug it! ha! sometimes “ish” is good enough, EC. Anyway, I’ll resay it if you don’t mind. Also, I’m annoyed at how I keep missing the posts and getting the shades. This is partly due to me not knowing if the timestamps are your S.D. Time, or my U.K time, and so not being able to predict the next one. Do you usually post around 1-2 AM on your end? or is that just me? hey, G-Man0091! yeah, it must not have posted, ‘cuz i checked the “pending” comments and didn’t see your comment in there. but your “Happy New Year” is still appreciated!!! glad you’re back and good luck on getting the Shades in 2012. the posting of the comic has been all over the place the last few weeks, but i hope to be getting back to a regular schedule, which means anywhere in the 1am – 4am range. happy hunting! Here’s where my maths and knowledge of the US comes in! Jingle bat, jingle bat, squeaking all the way. The lack of updates to this comic is totally gay. Oh what fun it is to find this webcomic updated some day!